What is Precision Content and Why Do We Need It? 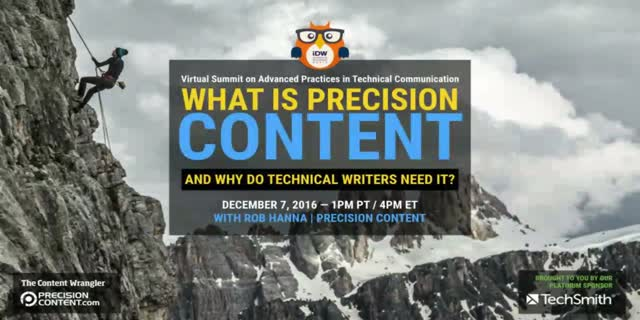 Precision Content is a series of methods and principles for structured authoring developed by Rob Hanna in 2013. This methodology is based on a well-known body of research founded in cognitive and behavioral sciences that theorizes that all structured information can be classified into one of a discrete number of information types. Each of these information types defines how the information is best structured and written to suit the intended reader response. Join Scott Abel, The Content Wrangler and his special guest, Rob Hanna, President of Precision Content for this free, one-hour webinar. In this session, Rob will guide you through an interactive exploration into how our brains work with information; explain how the Precision Content information types work to capture information used in any piece of business or technical content; discuss how Precision Content can help authors working with DITA/XML, and demonstrate how Precision Content is used to provide better clarity and precision to information. Title: What is Precision Content and Why Do We Need It?